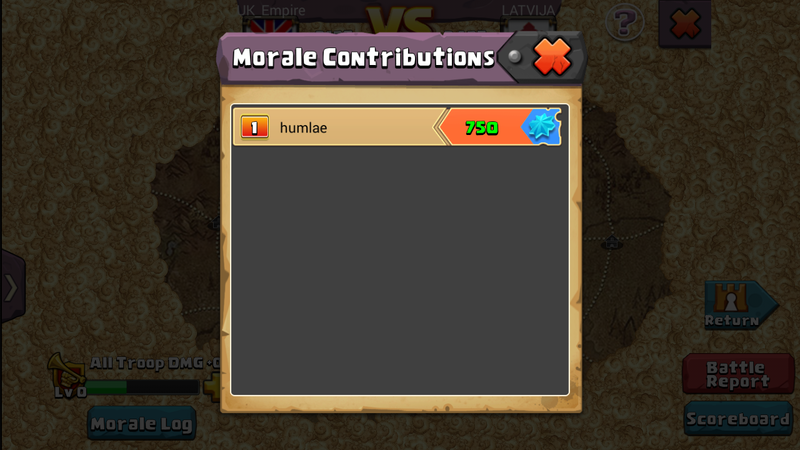 This is what you will see once you click on the Guild Clash button. Everyone that has signed up will be on the left hand side. 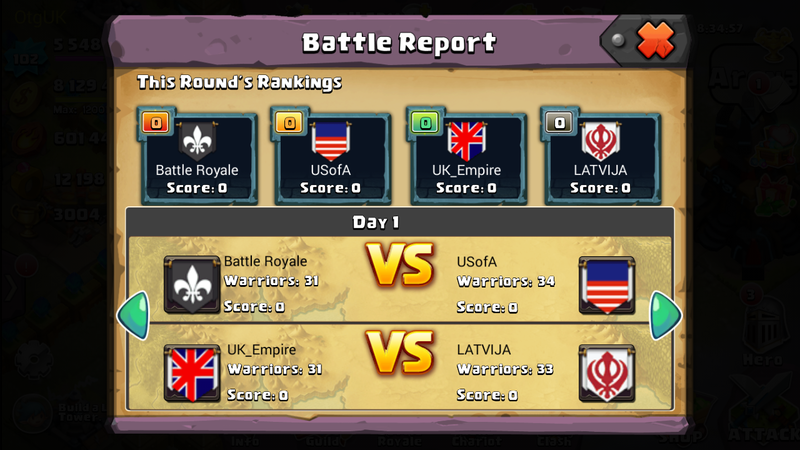 This is a battle report. 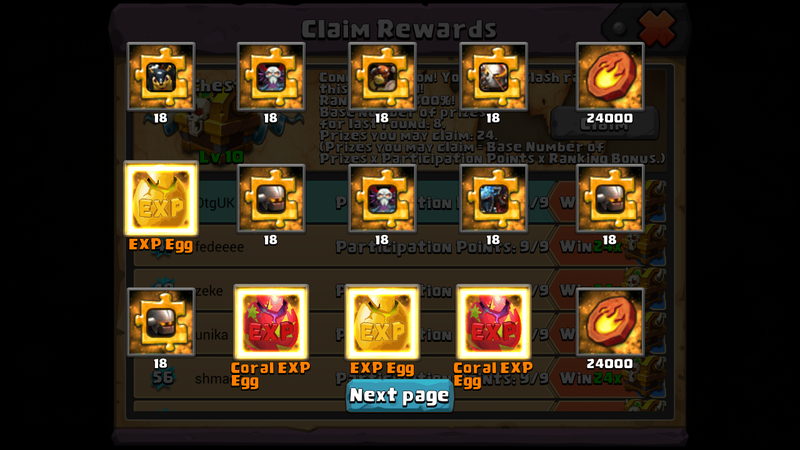 You total guild score will be shown here. 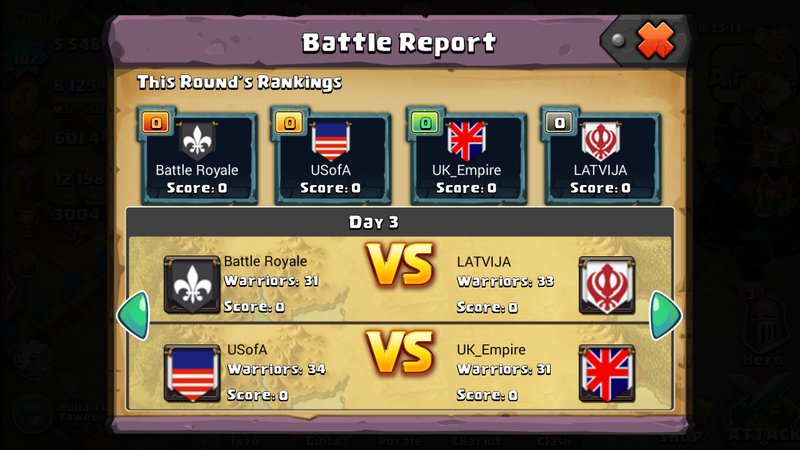 As the battles progress your pts for a win or lose will appear next to your name under the round rankings. 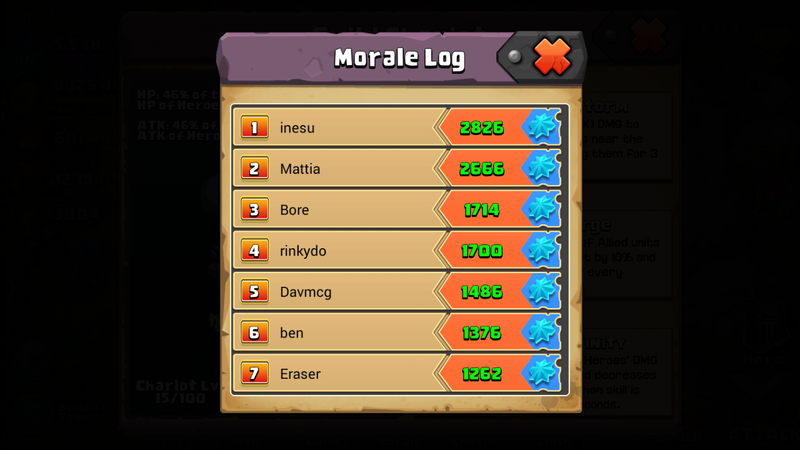 Before Guild Clash begins you can edit where you want your players to be. 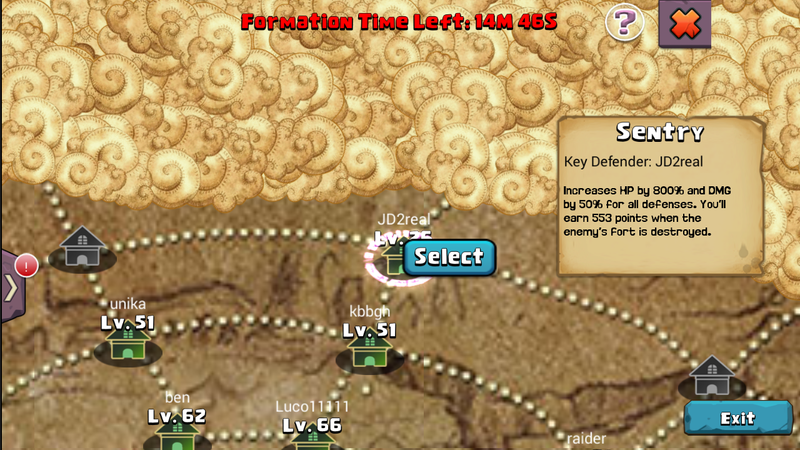 On the Guild Clash screen, click on the edit formation button. This is what the edit screen looks like. And move them to where you want. As you can see you have a limited time to edit the setup. Any elder can change the formation, so you had better trust your elders or have a guild wide understanding what your formation should be. To aid you in your battle, you have a Guild Chariot. 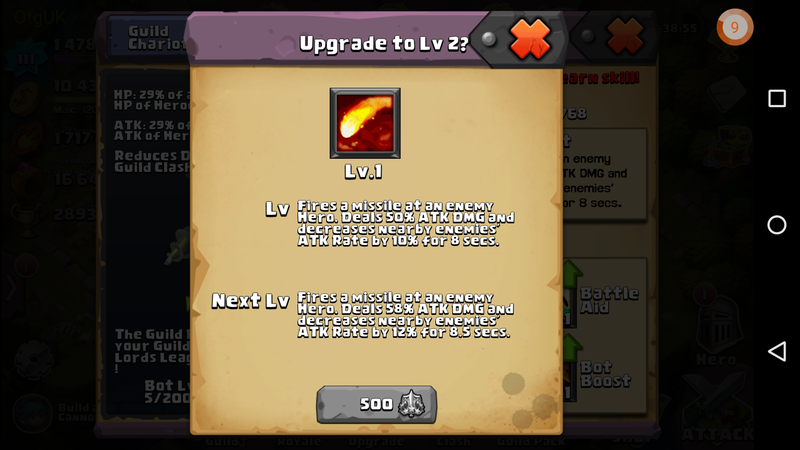 This starts at level zero and can be levelled up at any time. The active, passive and divine upgrades are not working or my guild has not gotten it high enough yet. 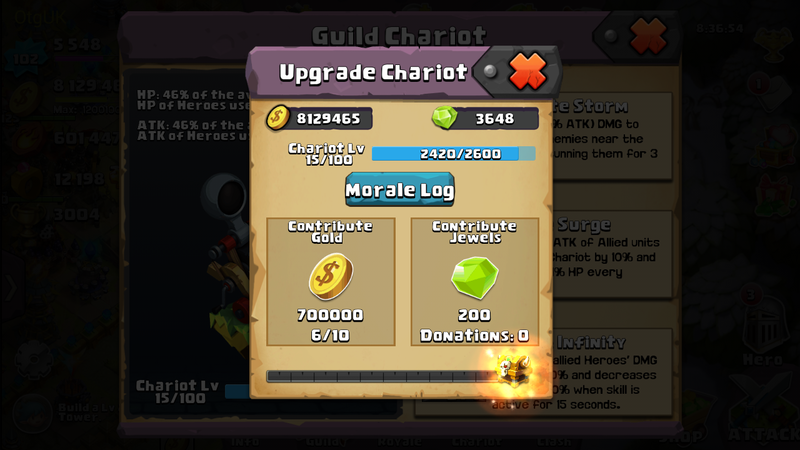 It makes complete sense to upgrade the chariot as fast as your guild can. This can be achieved with gold/jewels (this will now also upgrade your Bot but more of that later). A nice record of the players that have given the most is kept. 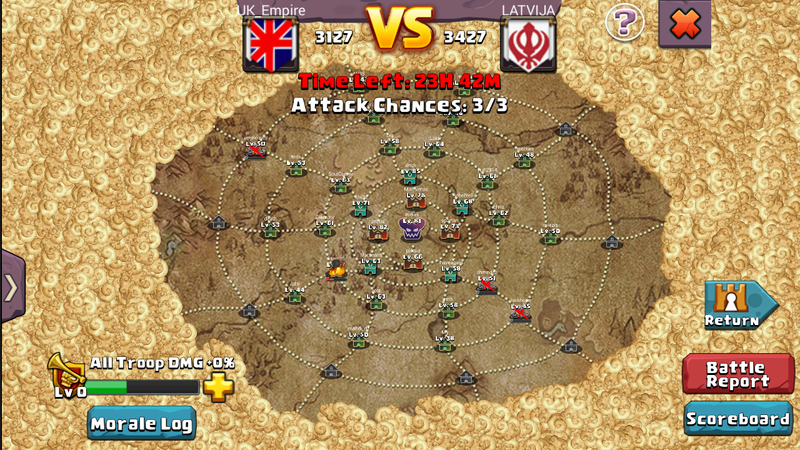 Now we can move onto the real battle field map. As you look at the map you can click on the view button to see the other team. 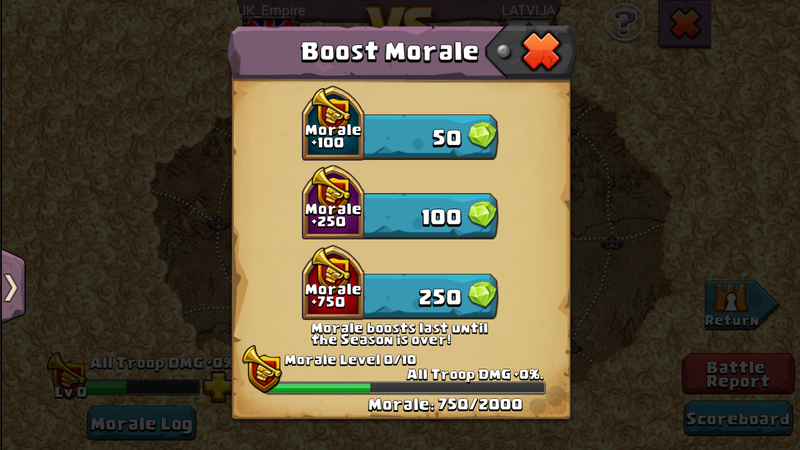 If you look on the morale log, you can see who has added some morale for your troops, all players get the morale boost when attacking. 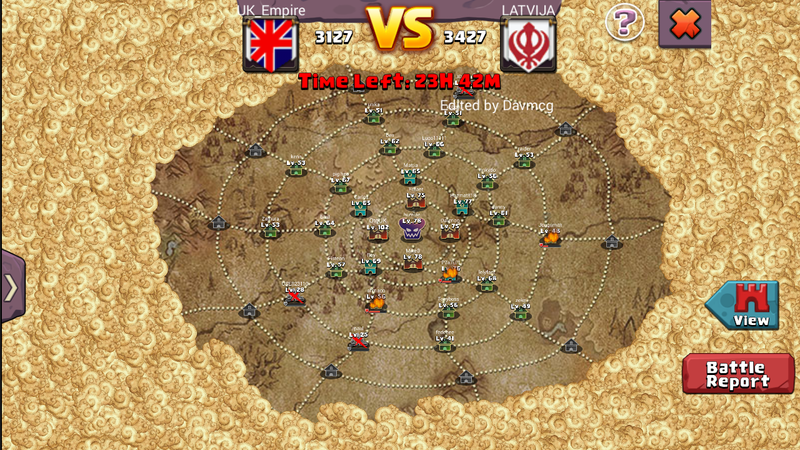 Now as it’s a 24hr battle, it’s best not to battle too soon, so that you can build up your morale and make life easier. Press the button with the amount of jewels you want to give. 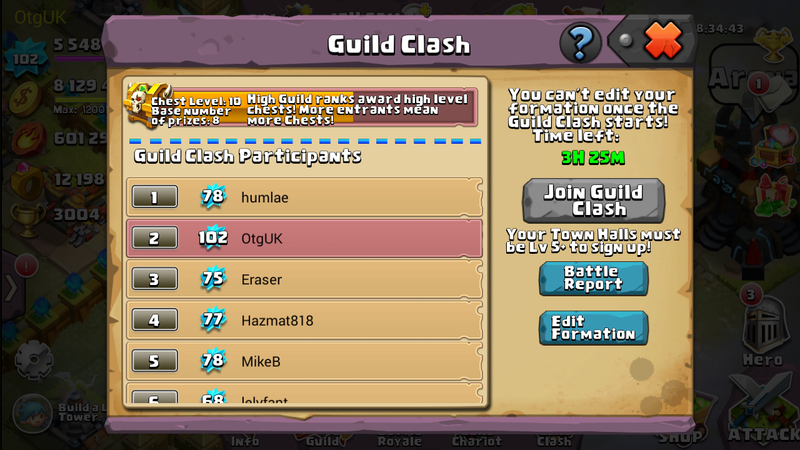 To keep track of what your guild members are scoring you can click on the scoreboard button. You will see a list of the players that have taken their goes and the score they have. Now it’s your turn to have a battle. Look around the map. If you have never had a go before then attack a base on the outer ring first. If you have an easy win then next time move in a ring. You will soon find your limits. Other things to watch out for when looking for a battle is the placement of their heroes. If you like the look of them, then take a closer look. Look at the heroes and their aids. If all five heroes have PG and Chiron as aids then look for another base to attack. Take the easy targets first within your comfort zone. So let’s have a look, click on your target, then click on recon. Once you have checked out the aids and if your happy, click attack. 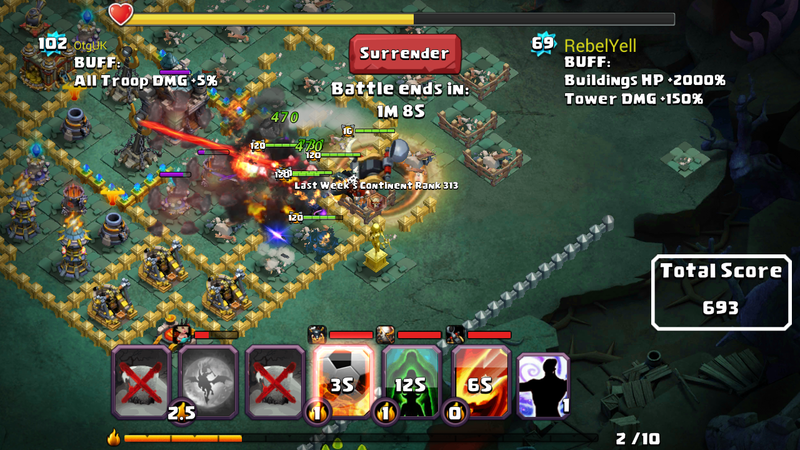 You have 30 sec before the battle starts to decide where to deploy your heroes. Now the battle is under way. 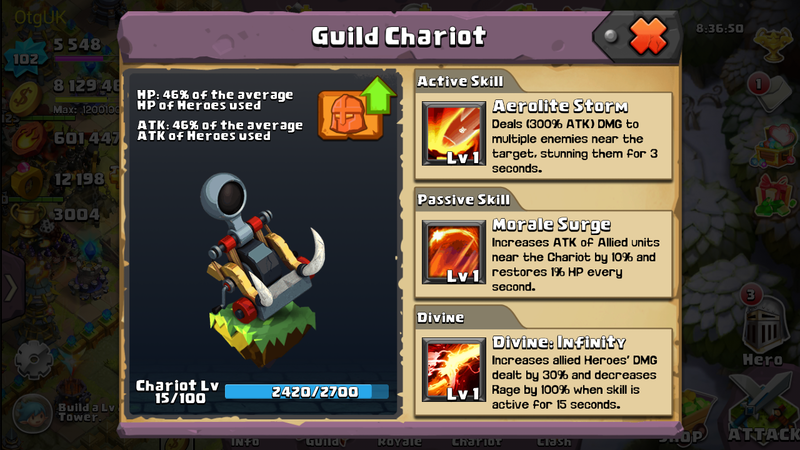 Use your chariots divine skill to spam your hero’s skills. A hero with a low cool down is better. You have 15 seconds, so make them count. 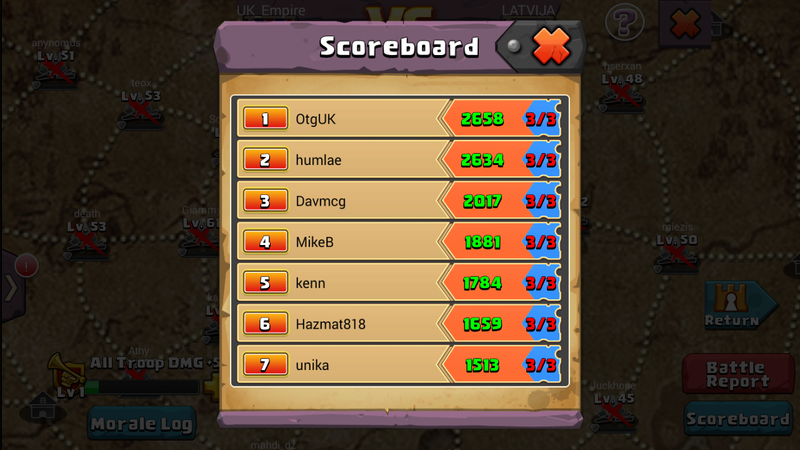 Once the battle is over you can look at the scoreboard to see how well you have done. 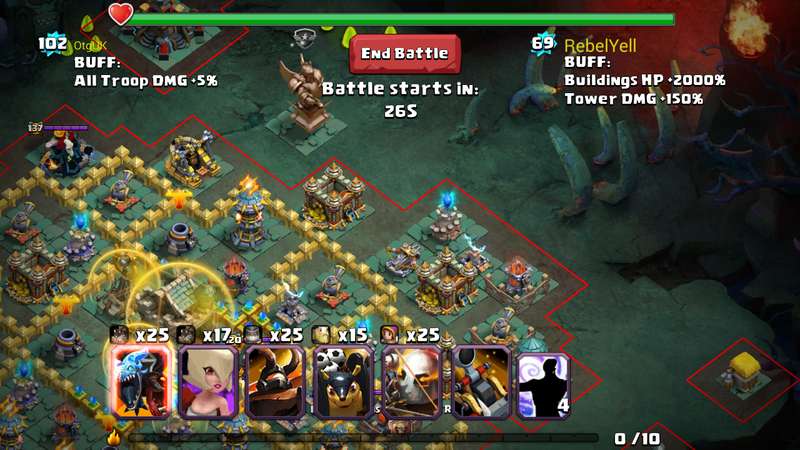 If you didn't clear the base then the next person to attack will get a % value left of the players base. This % value is for the whole base. 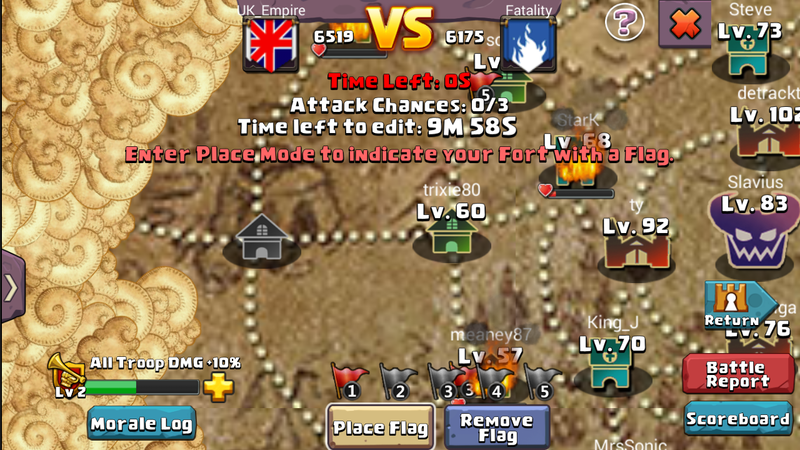 Using the Flags in Guild Clash is easy and helpful in winning the battle. Once the clash starts you can then place the flags where ever you think is the best place for your fellow guild members to attack first (Its best if you only have a couple of people moving the flags). Click on the place flag button, click on the red flag, and then click on the base you want the flag to go on. 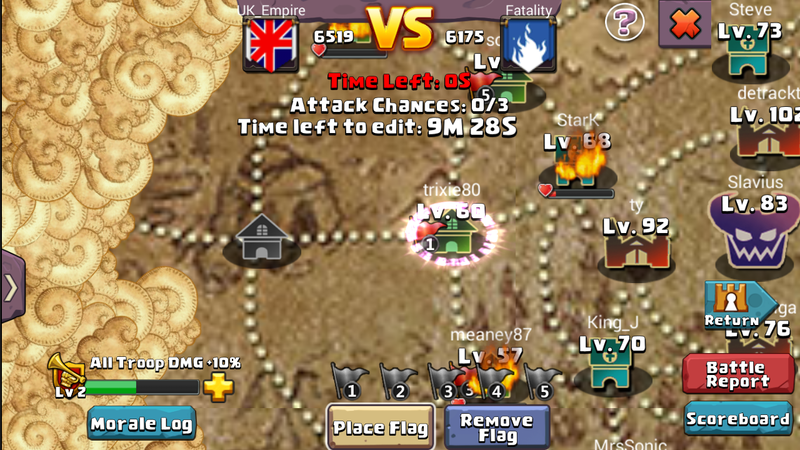 Then click place flag again to exit the mode (you can place more than one flag at a time). Now do that with your other four flags. 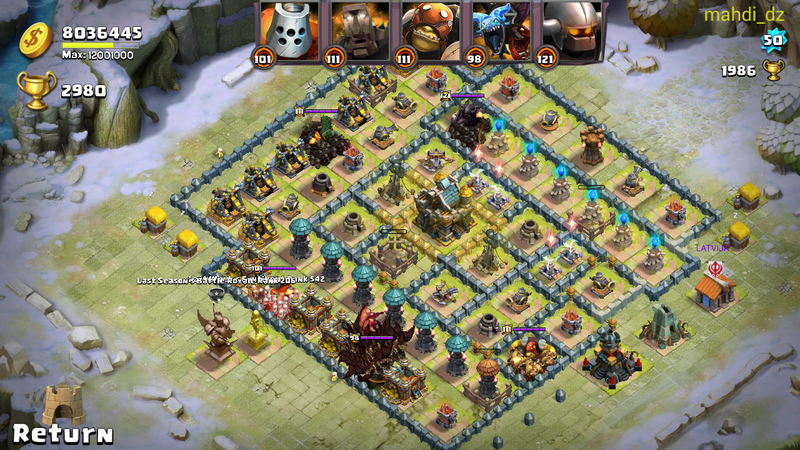 Come back every now and then and once the base is destroyed move your flags to another base. 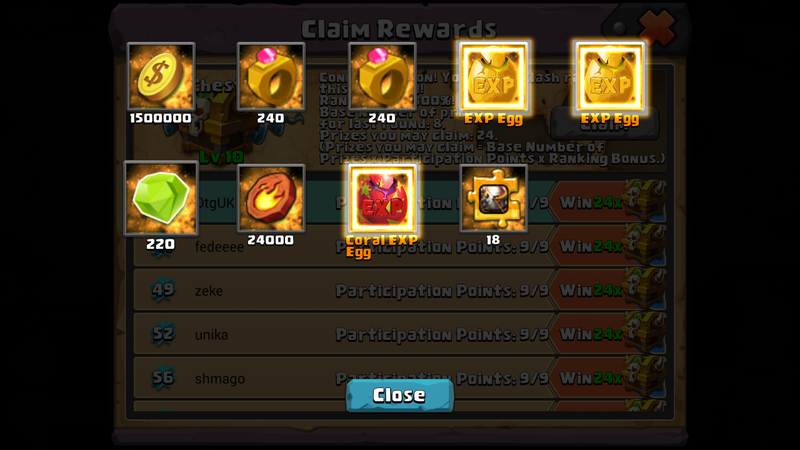 The Guild Bot is here, so let’s have a look at it. It can be found in the same place as your Guild Chariot. 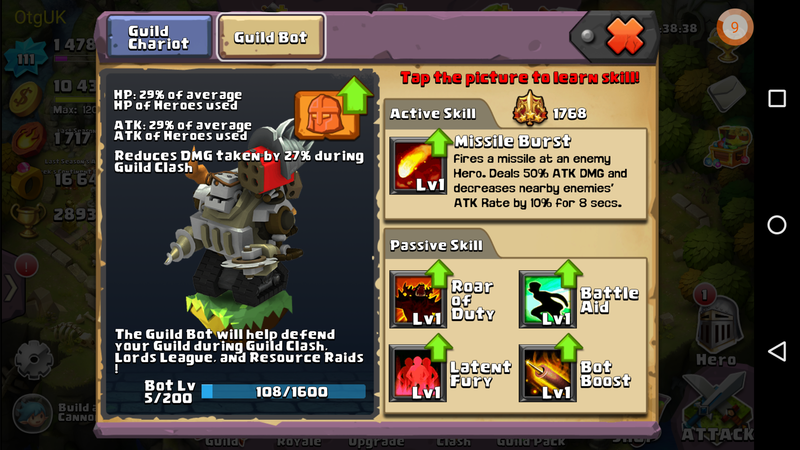 This Bot will help defend your base in Guild Clash, Lords League and Resource Raids. Nice right. 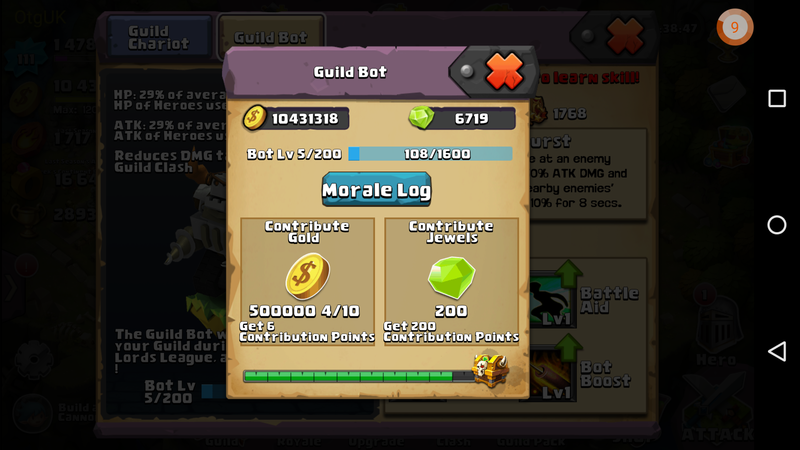 The Bot can be improved by donating gold or jewels. Jewels will give the Bot a bigger boost. The nice thing about given gold/jewels is that it counts towards your Chariot and vise versa. Once you have donated enough for your Bot to get to level 10, you can upgrade its skills, which there are 5 of. Now let’s look at the Bot in action. 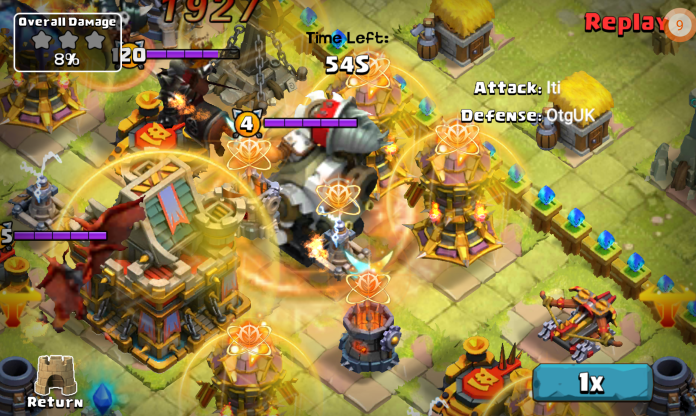 When you Bot dies it will explode given damage to any nearby heroes/troops. The one exception to this is airborne units. great post thanks a lot!!! cool I still can't battle but this is cool!